Nothing gets the juices pumping like a good horror driven action game, and that's exactly what you get from Nosferatu: The Wrath of Malachi for the PC gaming platform. The latest title from the fledgling publishing group, IGames, this slick vampire themed FPS will soon become a noir classic with its mix of intense action, heart stopping thrills, and brooding visuals. For more information on this scary title, check out the full review right here at The Laser. It's always a nice to see that the PC gaming world is not entirely made up of and dominated by the big corporate boys, ruling video game development with an iron (albeit digital) hand. Tons of upcoming and talented developers are patiently waiting in the wings for their chance to shine, and thankfully there are people that are willing to give them a go. Relative newcomers to the gaming publishing fold, IGames fortunately thinks the same way. Their latest release for the PC gaming platform went largely unnoticed in the glitz and glam of the winter quarter/holiday release schedule…but not by us here at The Laser. 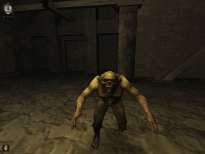 Nosferatu may hail from the independent realm of video game publishing, but its version of horror/survival FPS action is anything but low scale, and probably one of the most entertaining titles we played in 2003. Set in 19th century Europe, Nosferatu centers around the character 'James', an Englishman traveling by stagecoach to his sisters wedding to a Transylvanian Count. Upon arriving at the would-be grooms' castle, he finds that not only are his friends and family missing, but that the castle is a stronghold of bad folks. That's right….vampires! Now James must not only try and rescue his loved ones and fend off the blood sucking horrors of the night, he also must outwit an ancient and malicious evil that threatens the sanctity of the daylight world.The hokey vampire-horror-survival themes aside, Nosferatu played out very well as a PC title. For starters, the graphics were surprisingly good for a title with lower than average minimum requirements (P-III 733 Mhz CPU and 128 MB of RAM). The character, creature, and vampire models were all very unique in their look and design. The same goes for the surrounding visuals of the various parts of the castle, including the cellars, cemeteries, and other rooms. Adding to the dark and moody graphics of the game was an interesting 'scratched-film' visual effect, not unlike watching an old film from the 1930's or 40's. Topping off the 'horror-film' approach of Nosferatu was a great soundtrack and numerous audio effects and drops, mimicking such canned sounds found in the classic horror films of the early days of Hollywood. Going hand in hand with the game's great aesthetics was the gameplay itself. While most FPS titles tend to be predictable in their approach (get a weapon, shoot the hordes of bad guys, repeat), the designers of Nosferatu took a slightly different approach. Keeping the survival theme of the game in mind, players start off only with a sword-cane and their fists. By locating James' friends and families found throughout various places within the castle and bringing them to safety at the front gate, players can obtain new items found in the other's luggage. These include better weapons, powerups, and other goodies. Speaking of weapons, there are 8 of them that can be obtained throughout the course of the game. These include the aforementioned cane sword , the front loading flintlock gun, the musket, the revolver, the crucifix, the wooden stake, the machine gun, the ancient chalice, and of course your bare hands. Each weapon has its own unique attributes, specialties, and ammo (if needed). As with ancient vampire lore, the crucifix not only keeps most vampires at bay (albeit for a short time), it also has the ability to 'bless' normal pools of water into Holy Water, which in turn can be poured into the Ancient Chalice and used as a very effective weapon (you actually throw the water at the bad guys and watch them writhe in pain). The wooden stake can be used in standard combat (although hitting a target is a pain), but is really useful when you come across the coffin sleeping uber-vampires found throughout the game: one quick hit in the heart does the trick, preventing a time and ammo consuming battle with the minions of the night. The flintlock gun and musket use the same ammo, a deadly ball of lead that lays waste to most enemies in one shot. On the downside, each weapon can only fire a single shot at a time, and must be reloaded after each use. On the other hand, the revolver can take up to five rounds of ammo at a time. However, its lack of power doesn't do as much damage to enemies as the musket or flintlock gun. 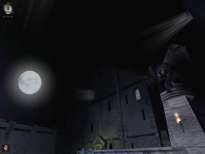 The piece de resistance of the weapons found in Nosferatu comes in the form of the machine gun, with a thirty round load, adequate damage, and quick reload. Keep in mind the survival theme of the game: that means that finding weapons and their respective forms of ammunition isn't an easy task. That means being extremely careful with how you use what little you have…you never know when you'll need that last bullet in a tight spot. 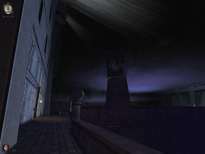 Another notable element surrounding Nosferatu's gameplay lies in the random map and creature generator. Incorporated into the game's engine itself, this cool little feature allows players to experience a different form of the game each time they start up. While the main areas of the castle remain as a shell (the three main wings and the two lower cellar areas) Nosferatu randomly creates new interior room designs, changing up the layout. The game also changes up the creature/enemy frequency for each room, giving players a different surprise each time they play. Not only that, but the game also randomly places the location for each of the 10 or so friends and family members that you have to find and rescue, making their safe retrieval a new challenge each time you play the game. All in all, a nice way to get tons of re-playability from a title. To wrap things up, I've got to say that I really enjoyed playing Nosferatu: The Wrath of Malachi. Nice graphics, creepy overtones, and addictive FPS action are all trademarks of this great title. The survival elements of the gameplay made this game stand above the normal shooters on the market, making players think about their tactics and actions instead of the using the mindless carnage associated with the genre. The random map and creature generator not only adds dimension to the game, it also gives gamers more bang for the buck by giving the game a ton of replayability. The only real problems we ran across while playing Nosferatu lay in the realm of stability: apparently the game didn't care for the AMD chipset of my computer, causing massive headaches and crashes. When we moved the game over to a P-IV machine running the same video card, RAM, etc., and the game ran without any problems whatsoever. Hopefully, the developers will address this issue in the near future. Until then, owners of anything but a Pentium based machine might want to be at least slightly wary of purchasing this title. 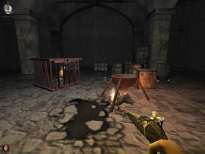 Beyond that, Nosferatu is an incredibly entertaining title that I'd recommend to any horror/FPS gaming fan.